The latest edition of Perspective, the journal of the RSUA, is out now. 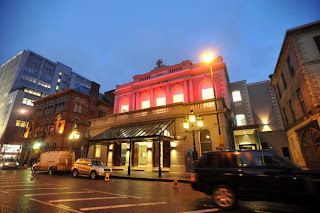 The main feature is a profile of the recently reopened Ulster Hall (pictured), refurbished by Consarc Design Group. There are also case studies of the Fitzwilliam Hotel on Great Victoria Street and the Grove Wellbeing Centre on the York Road. There are also reports on Tactility Factory (who exhibited at PLACE back in February), the recent Guerrilla Lighting event in Belfast, DSD's Streets Ahead plans (currently on display in weePLACE), and the activities of the architecture students at UU and QUB. Perspective is available now from the PLACE Bookshop at the price of £4. Back issues are also available, priced £2 each.